Super cute Sara! I love that cool girl. Love your card and the saying. It's so true. I like how you colored it. I love your site. Your cards are so nice. My MIL would adore your Texas Greetings one! WOW,, your site sure is fun! 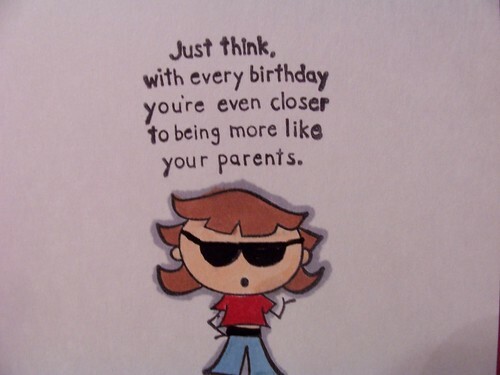 I love your birthday card, the humor fits me to a "T"! I also snooped around, I couldnt help myself, and checked out your scrapbook pages of your children,,, all I can say is>> TOO CUTE! What a great card! I am sure your dad will get a kick out of it! Great card! I hear you about making do, but that takes a lot more creativity than having every single little supply and tool. Gotta use your brain! 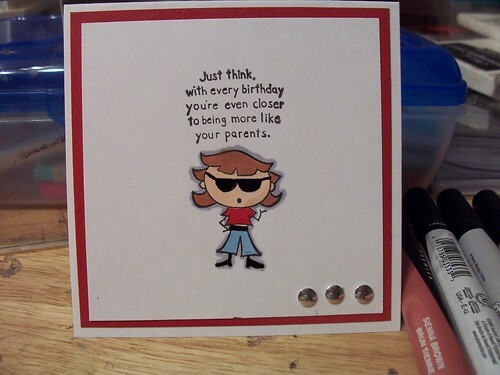 Cute card...fun blog! Neat projects. I enjoyed looking at your blog. Cute kids! I love your waterfall album and the medallion on the leaf card! Love that image and the saying is cute, too. Nice job! Loved your dad's card, very funny! and true! Loved your dad's card, very funny! Loved your dad's card!very funny! Cute card. Just love the attitude! Aww... what a cute card! Great job!